Thanks to a post by @lewiszhang, I discovered a couple great products from Embed.ly. First off, they have a Chrome plugin that adds in-line previews for links from hundreds of sources in your Twitter stream. Second, they have a WordPress plugin that will change a simple URL in your post body into an embedded preview, as below. Great stuff! We’ve updated the Notices section of Settings to better reflect how folks are using Twitter regarding replies. Based on usage patterns and feedback, we’ve learned most people want to see when someone they follow replies to another person they followâ€”it’s a good way to stay in the loop. However, receiving one-sided fragments via replies sent to folks you don’t follow in your timeline is undesirable. Today’s update removes this undesirable and confusing option. From what I understand, hiding @replies to people you didn’t follow from your home screen was already default for new Twitter users. Users had to actively go into the notifications settings and enable @replies to everyone to show up on their home screen. I had mine set to show me all @replies. @replies have actually been my primary method for finding new interesting people to follow. Someone I know would start having a discussion with someone I didn’t know, and if the discussion was interesting and relevant to me, I’d often start following the other participant. It’s how I found some of my favorite Twitter people. Now, I don’t even have the option to see these replies and discussions. There’s no way to opt back in. That’s absurd. A couple other blogs have illustrated the issue much better than I have… be sure to read Jared Smith’s post and Read Write Web’s post about the issue. In the meantime, putting any character infront of an @reply on Twitter will make the message show up for everyone following you, but does break the “in reply to” link feature on Twitter, as well as subject everyone to the message, regardless of what their “@replies from people I don’t follow” option was set to in the past. I’m using the #fixreplies tag to talk about the issue on Twitter, and it has apparently been the tag that has trended to the top tonight. I generally embrace change, especially in online tools and communities. But this isn’t a change or addition, it’s actually taking away something that everyone seemed perfectly happy with. And for many of us, it was the mechanism that really made Twitter the interesting, useful, and exciting tool it has become. The Twitter team has already updated the official blog post, trying to claim that there are plenty of other methods for discovering new and interesting users on Twitter. This is pretty ineffective damage control right now though, and I hope that we’ll see the system revert back to the flexibility and customization that we were used to soon. I’ve read speculation that the change was made to relieve server load for Twitter, and that makes sense, but getting rid of such an integral behavior is not the way to go about it. It feels like taking the engine out of a car because you’re trying to get 5 more miles per gallon. Thanks to a post over at Eloquation.com I have discovered MyMileMarker.com. This site lets you add vehicles, and then add data whenever you fill up at the gas station. Once you enter in a few data points, you can see reports on your vehicle’s fuel economy and cost to drive. The site even appears to project your expected mileage and economy into the future. I started using jMileage several years ago on my PalmOS PDAs, and had over three years of data on two different cars… so I am completely addicted and ingrained with the concept of tracking vehicle fuel economy. Switching to Windows Mobile, and now the iPhone, I never found a program that did the job as simply and efficiently as jMileage. I think MyMileMarker may be the perfect replacement (web)app for me. MyMileMarker provides a mobile interface to the site at www.mymilemarker.com/m that loads great on any mobile browser. They’ve gone the extra mile though, and offer Twitter integration. You add mymm to your friends, and then you can throw log information at your account through Twitter, meaning you can use e-mail/SMS/Mobile Twitter, or many other Twitter posting options. 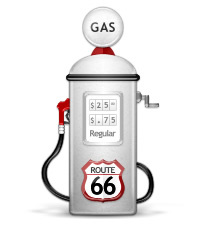 There are several benefits to tracking your fuel mileage. Besides showing you how much money you sink into fueling your car, you can also keep tabs on your mechanics. If your mileage drops significantly, it’s a nice heads-up that something isn’t right. I’m looking forward to having a clear view of my car’s performance again, and this time it is completely independent of the mobile platform I want to run. You’ve got to love web apps.